The first time I ever had dates was in cereal – Post Selects Great Grains, to be exact. It wasn’t a raisin, much tastier and more exotic than that… it was something different and (I still think) better in the cereal context. What if instead of Raisin Bran, we also had Date Bran? I would definitely buy it. Dates, of course, have far more uses than just in cereal. As we learned from Melissa and Matt’s wedding last summer, dates wrapped in bacon are just about the best hors d’ouevres ever. We’ve also tried stuffing those bacon-wrapped dates with blue cheese, and we really liked that result as well. 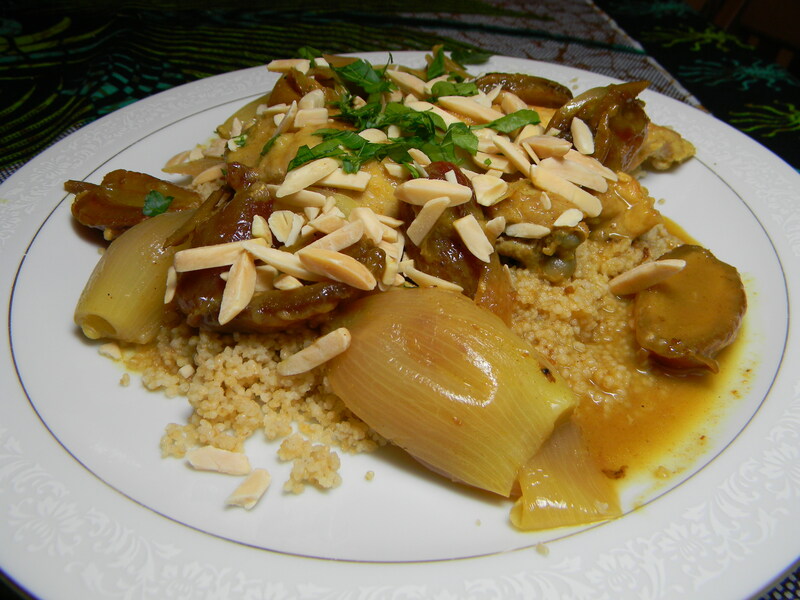 In the recipe posted today, dates play a primary role in a dish with exotic Moroccan spices and a really rich, unique flavor. To adjust the dish to make for two, we used a cornish game hen instead of chicken, but you could do either depending on how many you want to serve. Just don’t skimp on the dates! And, just because I can’t help it, may we recommend this dish for a date night with that someone special…? Oh! Where to get dates? We got ours at Trader Joe’s – a large pack of fancy medjool dates there is only $4.95 – it was enough for this recipe and the blue-cheese stuffed, bacon-wrapped appetizers. That’s really interesting! I knew I had never seen a ‘fresh’ date before- but I guess they all are, in a way. Thanks for sharing! Dates are the best dried fruit out there!! But not the hard brick of dates you find in the baking aisle… fresh, gooey, sticky dates. Did you know they dry on the trees, so you’ll never find a fresh date?? Learned that morsel from Anthony Bourdain!